I knew that one day we would be missing John Kerry, unfortunate candidate for the White House 4 years ago. Babalu brings us how Obama supporters and even some Clinton ones, are not adverse sporting a Che image. Since I just put up one of these Che Guevara misplaced nostalgia, it is only fitting that I put up these misguided office decoration by some supporters of Obama. 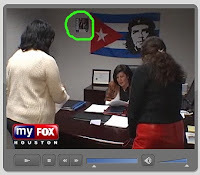 In particular this pic (courtesy of Fox via reader A. and Babalu) where the poster of Obama (circled in green) is dwarfed in front of the ridiculous Cubano Guevarista flag. Does the woman sitting at that desk really know the life and times of Che? Could she not even be bothered to find a bigger Obama poster, or more than one at least? Is she supporting Obama because he is the first Black Kennedy or because he will remove Bush from office? Has any one explained to her that no matter what Bush is gone next January whereas Cubans are still suffering from the cruel system that the Che helped put into place? Is there an end to human stupidity? Really, the Democrats were not as stupid when I was a US Liberal 10 years ago..... then we worried about real issues such as abortion rights, ERA, gay rights, Act Up, affirmative action, fair taxes, MLK, Jesse Helms and such without having to invoke for help Fidel or Che.